In just a few weeks, a “fragrance battle” will rage in my sunny, hot and dry front yard: tuberose vs. milkweed. I trust most perfume fanatics know the scent of tuberose; if not, either smell Robert Piguet Fracas or Frédéric Malle Carnal Flower or go to a florist and purchase a few stalks of fragrant tuberose and let the blooms perfume your home. As I smelled Astier de Villatte Eau Chic by perfumer Françoise Caron for the first time, I was shocked; the fragrance smells like tuberose and milkweed. Even better, it’s the first tuberose scent I enjoy wearing. Eau Chic contains rosemary, thyme, petitgrain citronnier, lavender, ylang-ylang, rose and tuberose. Eau Chic starts off sharp and citrus-y and segues quickly into milkweed’s strange combination of pungent and powdery notes. Tuberose becomes apparent in mid-development and threatens to turn soapy, but the inspired use of tangy herbs, rosemary in particular, with the creamy white flowers gives the tuberose some “bite.” On my skin, Eau Chic’s tuberose becomes “chalky”/mineralized as it dries, and it outlasts all other notes in the composition. Eau Chic has become one of my favorite Eaux de Cologne; it’s so different. Eau Chic wears like an Eau de Toilette; sprayed on lavishly, it lasts all day on my skin and has pleasant (not too widespread) sillage. As for the fragrance war in my front yard: tuberose hasn’t a chance against common milkweed. If you have a garden, especially a big one, consider planting some milkweed: the butterflies will visit, and you’ll experience one of the most beautiful and complex floral fragrances in nature. 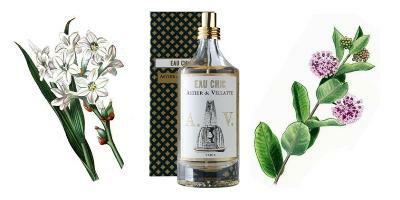 Astier de Villatte Eau Chic Eau de Cologne is available in 40 or 900 ml splash and 150 ml spray (in mouth-blown glass bottles made in Florence, Italy); it can be purchased directly from the Astier de Villatte website. Note: top left image of tuberoses, top right image of common milkweed, and bottom right image of Monarch butterly image via Wikimedia Commons. I love the smell of milkweed and didn’t think any perfume utilized it. Good review. Speaking of great smells that aren’t used in perfume…does anyone know of a perfume that uses the Basswood tree? They are blooming right now in northern Minnesota and I was swooning over the 4th of July. Powerful sweet and floral, the flowers are teeny tiny but man they pack a punch. Anything? Thanks. Basswood tree is the same as American Linden tree. They’re great – I have one in my front yard. I believe there are a lot of scents with a linden tree note. Off the top of my head, I believe Delrae’s Debut has a good linden note, and I know Jo Malone has a French Lime fragrance. I think in Europe they call these trees lime trees. It’s a bit confusing. I spent a lot of time researching the tree in my yard because I like its fragrance so much and was surprised to find it was a linden. So that’s why I like Debut so much! Jirish: true, linden/”British” lime should be easy to find…but those scents don’t compare to the real flowers to me. You should put a hammock under your tree and sleep there till it stops blooming! Kelly: Yes, the basswood smells delightful…I’ve smelled a few here in arboretum/botanical gardens. In these cases, I think we just have to hope some combination of “standard” notes produces the fragrance we love. The first time I was ever in Central Park in NYC was when all the linden trees were blooming and after a fresh sunny summer rain… It’s one of the best “smelling” memories I have. Promise: a great way to “meet” Central Park…that’s for sure. Kelly Red, I didn’t know that basswood is the same as linden. Interesting! I don’t think I have smelled the actual trees, but I tried D’Orsay’s Tilleul for the first time this week. I believe that it is based on the suggestion of linden. I thought it was very beautiful! The French word for ‘linden/lime’ is ’tilleul’. This perfume sounds lovely, Kevin! Great review, as usual. This combination of notes sounds amazing to me, even though tuberose is a difficult note for me. The website for Astier de Villate is very cool, but I confess I could not find the prices for the Eaux (or figure out how to place an order on the website). Any tips? MJR: look at the bottom of my Delhi candle review for ordering/info. Just look under “Author” “Kevin” and the review should be recent. Thanks for pointing me to the Delhi review; I missed that one. Candle sounds delicious as well, but I must steer clear of such high-priced candles! Joe: just buy ONE a year? Fascinating review Kevin! I’ve never smelled milkweed before, but now you’ve got me on the hunt. The shape of the Astier de Villatte bottle reminds me a little bit of the milk glass Old Spice bottles! K-Scott: you should be able to find a milkweed variety nearby…good luck. How wonderful to read about Milkweed and Monarchs and this unheard of EdC, Kevin. Thank you for a very special article and for supporting stressed species. Some day the scents of America will get explored more thoroughly by perfumers. Quarry: I know…wonder if there’s a natural perfumer around who could tell us if milkweed aroma can be processed from the garden plant…. Like our “mimosa” trees… which smell divine, and totally unlike European mimosa. Oh, neat! I’d love to smell milkweed now. Kaos: I was so excited…the first tuberose I can wear and enjoy all day. Hope you can sample it. Great reivew Kevin – I’ve not ever heard of this fragrance or line, so I’ll need to check it out. BTW – it totally cracks me up about the milkweed in your front yard. When I was a little girl, we had lots of milk weed growing wild in the field near our yard. My sisters and I used to peel down the pods and throw the oozing, milky things at each other! Ah, memories, lol. Anns: Milkweed grew all around the corn and soybean fields where I grew up and I never could pass a plant without peeling off a leaf to see that white “milk” ooze. I know! It’s compulsive – it grows everywhere around where I am now in the boonies, and I always want to peel a pod! And see, I was so fixated on the milky pods that I never even noticed the flowers. I’ll have to smell them next time I’m at my parents’ house. I can remember the smell of the “milk”, though! Boojum: you missed the flowers…if you were seeing the pods. I didn’t miss them, so much as fail to notice them, if that makes sense. They grew all along our driveway when I was a child, but I didn’t remember that they flowered until I saw the picture above; only the milky pods stuck in my memory. Ann, I remember doing the same thing, except I didn’t know until now that it was milkweed. God, I miss being a kid. Especially during summer. I love the smell of Milkweed and Monarch butterflies are one of my personal obsessions (have always wanted to follow their migration through Mexico) so I read your review of this obscure fragrance with interest. Once finished reading I promptly clicked the website you linked for us because I need to have some. My goodness, what an oddball site!! I couldn’t even sit through the weirdness to find the bloody cologne. ((loud sigh)) is there anywhere else to buy it? Perfume Sniffer: look at their retailer’s page and see where their products are sold near you… I’m surprised no one’s picked up this line in the U.S. since the three colognes are great…and much better than a bunch of other lines I could (but WON’T) name. HA! gah! I agree.. where can I buy this online? This really is the year of the tuberose, isn’t it? This cologne sounds wonderful, and I’m always glad when you get to review something delicious, Kevin! I enjoyed looking at the website, too. The candles sounds great! I can’t help but laugh at the notion of PLANTING milkweed! Around here that stuff grows like, well, the weed that it is. When I was a kid we used to collect stalks of it, caterpillars and all, and create our own Monarch butterfly farm — the cocoons are especially gorgeous. As for the scent, I’m still iffy about tuberose, but I’ll take your word as a fellow tuberose-skeptic! We didn’t have much success with collecting them; only once did I manage to get a caterpillar to spin a chrysalis (gorgeous pale green with a ring of gold) and then emerge as a butterfly. Lilydale: thanks to me…opium and California poppies and milkweek are taking over the neighborhood. HA! Kevin, I wish I had your yard – ours doesn’t get enough direct sun to grow lavish amounts of milkweed. But I’ve gotten a few plants going – both ‘showy’ (white) and ‘swamp’ (pink). Along with my bee balm and Joe Pye Weed, they are my favorite flowers. Thanks for a great review! Swamp! No wonder they were so prolific… our neighbors had a small swamp in their woods, just a short stretch from the shared driveway. Dzing: you’re welcome…dare you throw some milkweed seeds in a sunny ditch near your home? I remember in grade school picking and splitting open the milkweed pods that grew by the school fence at recess. I need to get some of this! Great review, Kevin. I’m not particularly interested in a tuberose scent, but I’m *always* interested in helping our environment. So it was great to learn about milkweed and the Monarchs. I’ll return the favor: FYI, 22 species of birds enjoy eating the berries from Winterberry bushes! rAPPLEYEA: I banned all sharp-leaved and most thorned plants from the yard during the years I had a pug and English bulldog: eye concerns. But I do have tons of ‘berried bushes’ in the yard for the birds. Ahh…. aren’t you a good Dad. Tuberose has to be one of my favorite scents and I’m pretty excited about trying this fragrance. Plus, I love love love that vintage simplicity of the bottle. As soon as I buy a house, I’ll try to plant some milkweed. It would be nice to have visits by insect perfumistas. NaturalSelektion: yes, the Monarchs have good taste. Thank you for the trip down memory lane! I haven’t smelled milkweed flowers since I was a kid in a little town north of Ottawa. 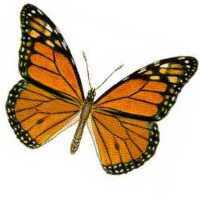 I spent summers wandering through fallow fields ful of milkweed and monarch butterflies. Milkweed and clover, tall dry grass and tiny wild strawberries = the smell of being 7 years old. That’s such a great memory, Kjanicki. It was the same for me growing up with wild meadows and woods nearby. We used to pick those wild strawberries too! I am lucky that all kinds of neat wild things grow near me now as wee – including those little strawberries and milkweed, Joe Pye weed, wild roses, etc….I love the smell of sun warmed “sweet meadow”. That would be great in a bottle! Same here (and as an aside, the only “real” vacation we took when I was a kid included a trip to Ottawa…lovely city!). You should both try CBIHP’s A Room with a View… it has that hot dusty meadow-like smell, and while I’m not a big fan of violet, this is neither powdery nor candied violet. It smells like pure Midwestern indian summer to me, and is one of the few things I plan to buy this quarter (alas, I could only try the absolute, so don’t know how the water perfume compares). I know we’re supposed to be EST’s, but you have really sold me on Room With a View. The idea of a “sweet meadow” smell along with the name of a favorite book/movie is almost too much to pass up! Very interesting review, Kevin. I haven’t seen milkweed “puffs” since I lived back east, I think, and I’m not sure I ever smelled the flower. If they did well in arid California, I’d consider planting some, but I’m guessing they’re not suited to this climate. Now I’m so curious to smell milkweed blossom. Maybe I can hunt around and find some plants while I’m in New Jersey next week — I love all the truly jungle-like flora that burst forth there in the humid, hot summer. This cologne sounds unique. I know I’ve looked at the AdV site before (forgot one of their main lines of business is tableware)… but that site makes me want to punch my computer — totally not obvious regarding how to order, and trés, trés annoying graphics and such! They barely deserve any business!! This is not a side of our sweet and sweet-smelling Joe that I’ve ever seen before! Joe: it’s dry as a bone here in Seattle in the summer so I’m sure you’d be A-OK in Santa Barbara with milkweed. And the folks at AdV in Paris are super-sweet…just email them and they’ll respond immediately. Thanks for both tips. I’m just curious if the 40ml bottle is in possible price range or too rich for my blood (as a set of AdV tableware would be!). Joe: the pricing is 40, 79 and 195 euros for 40, 150 and 900 ml. SHipping charges will add a bit more, but not too much for a 40 ml bottle. If you click on the website cited by Kevin, then click on the “tarot” card labelled “International”, a photo comes up of a man and woman looking at a slowly spinning globe. Click on the USA when the N American landmass appears. It will give a map with dots in various cities. Click on the dot, and it gives the name of the store … Voila! I was only able to figure this out because of having spent 45 mins trying to find out how/where to apply for a new passport!